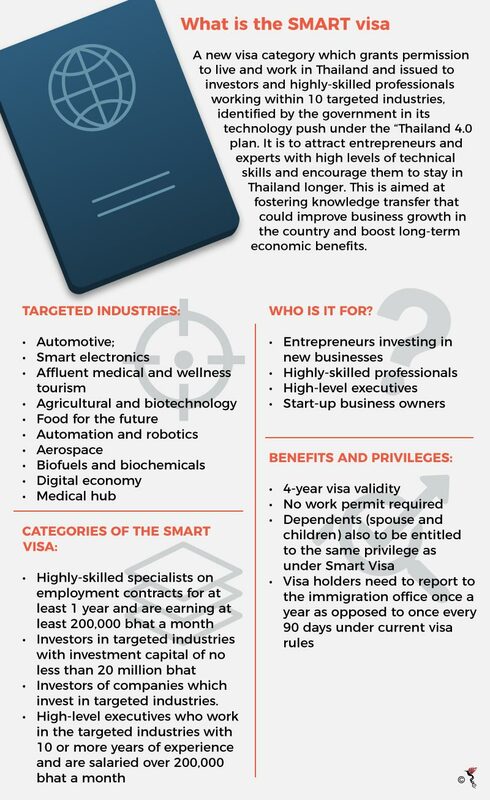 High level executives, investors or professionals in industries of the future like aerospace, automation and biofuels can now live and work in Thailand under a new visa scheme called the SMART visa. This new visa bracket is aimed at encouraging more investment and expertise in 10 targeted technology and knowledge based industries which have seen significantly higher growth rates in these past few years. Holders of the SMART visa would not need a work permit and their visa validity period would be four years. Their dependents would also be able to enjoy similar privileges under the program. Moreover, those with a SMART visa only need to report to the immigration authorities once every year as opposed to once every 90 days under current rules. Those eligible are separated into four categories – talents in science and technology, investors, executives and startup entrepreneurs. Applicants will have to adhere to set criteria and be certified by relevant government agencies like the National Science and Technology Development Agency (NSTDA), the National Innovation Agency and the Digital Economy Promotion Agency (DEPA). They must be able to provide sufficient proof of their expertise or talent as well as necessary certifications of their participation in the 10 targeted industries. The 10 targeted industries include food technology, biotechnology, robotics and automation and are slated as key drivers of Thailand’s ambitious Thailand 4.0 goals. The selected industries are considered the prime engines of growth for this new economic model and the government has been actively promoting private investment in these fields. Now, with the new SMART visa, the Thai government is looking to attract foreign talent and investors to help propel these industries and essentially power these growth engines. According to Duangjai Asawachintachit, Secretary General of the Thailand Board of Investment, the past two years has seen strong growth in investment in the targeted industries. “In 2016, investment value in the targeted industries was approximately 299 billion baht (US$9.3 billion) and increased to 392 billion baht (US$12.3 billion) in 2017. BOI anticipated that investment from targeted industries will exceed 400 billion baht (US$12.5 billion) in 2018," she said in a statement. The Thai BOI has set an investment application target of 720 billion baht (US$22.6 billion) for 2018 with a focus on targeted industries. In 2017, the total investment application value was approximately 642 billion baht (US$20.1 billion), an increase of 22 percent from the previous year. “We want BOI to continue to give more weight to agriculture, food, digital, logistics, education, tourism, and services industries in 2018 because they are vital to economic growth,” Thai Deputy Prime Minister, Somkid Jatusripitak said in a statement. The government, in recent times, has also been attempting to increase the convenience for foreign investors to invest in existing Thai businesses, or for them to start businesses of their own in the kingdom. “In recent years, the Thai government has improved its services, resulting in the improvement of the country's ranking in the World Bank's Ease of Doing Business report from 46th to 26th. The SMART Visa will increase convenience in facilitating investors doing business in Thailand,” Asawachintachit added. Besides that, the Thai government is also looking to improve the quality of local labour in the industry from the knowledge transfer gained by experts who come to the country via this initiative. Asawachintachit pointed out that by having professionals in these fields in the country on a long-term basis, Thais can benefit from the transfer of knowledge. This would help further enhance their skills and overall quality of Thai labour in a sector which currently lacks talent in certain skillsets.